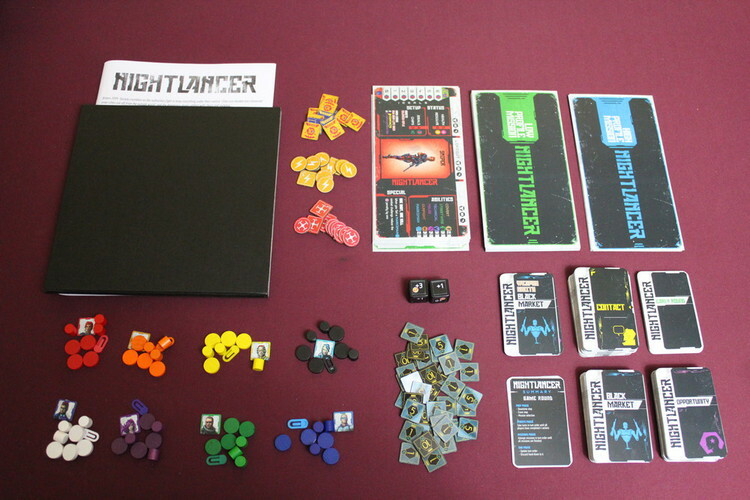 NightLancer is a character building, worker placement game set in a dystopian, cyberpunk world of Birmingham in 2099. The first thing I noticed when opening this is the sheer quality. This is by far the nicest prototype I have ever seen! Shuffle the contact deck, the black market deck and the opportunity deck and place them in their separate piles at the side of the board. 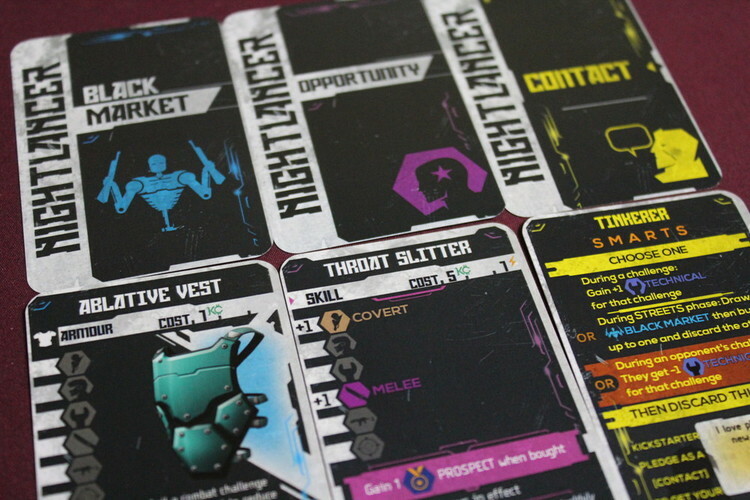 The black market deck is gear that will help you build up your character and help you on missions. The opportunity cards are either skills which will help you power up or are agendas, which are achievements for you to complete, rewarding you in the process. The contact cards can be used in a variety of ways, sometimes an agenda will ask you to discard a specific contact, they will also have an ability that will allow you to draw cards. Then they will have a choice of ability that can be activated in the mission phase. Either you can discard them to help you complete a challenge or they can be used to obstruct other players.Shuffle the high and low profile mission decks and place them on the other side of the board. Shuffle the late round event cards, randomly draw four and place them on the spot marked round cards on the board, then do the same with the early round event cards, placing them on top. The game is played over eight rounds and an event card will be revealed at the start of each so this is your round tracker for the game. Decide the order of play and put one of each players status tokens on the appropriate spot on the turn order track, place another at zero on the prospect track and the final one on the zero of the heat track. 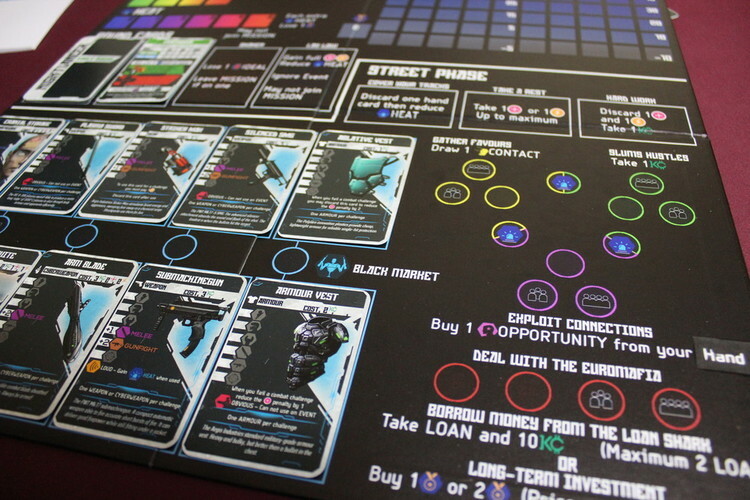 Fill the appropriate spaces on the board with black market cards, depending on the number of players. Ensure all tokens are within easy reach. You are now ready to begin playing. In each round, other than the first, all players gain one health, one resolve and draw two contact cards. Loan interest is also paid, pay one to the bank or else lose three health and three resolve. Turn over the top card of the event deck and draw the number of high and low profile missions it indicates. These will be the missions players can choose from this round. But before anyone can look at missions, players must complete the event challenge. Challenges all work in the same way, be they on events or missions. A skill will be shown along with a number, roll one of the challenge dice and add that to your skill. If you get equal or higher than the number, congratulations, you have succeeded. If it is lower, you have lost and must suffer the penalty shown on the card. After the event card for the round has been resolved players will take it in turns to choose which mission they want to go on this round. 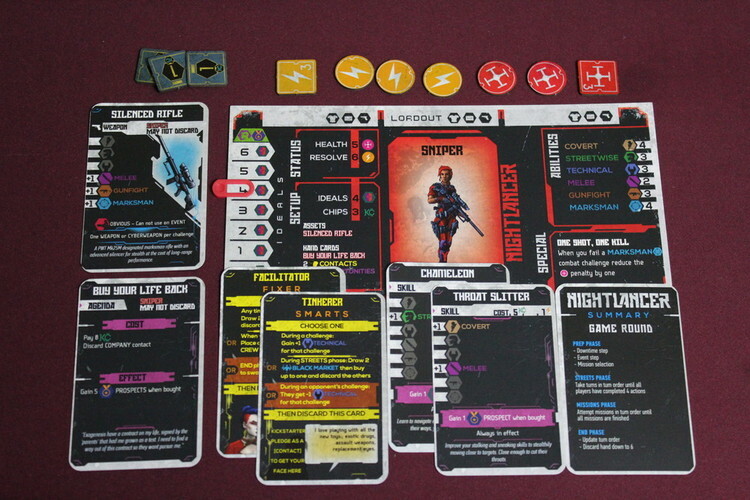 Starting with the first player, players place their Nightlancer token on the first space on the mission board they want to attempt this round. 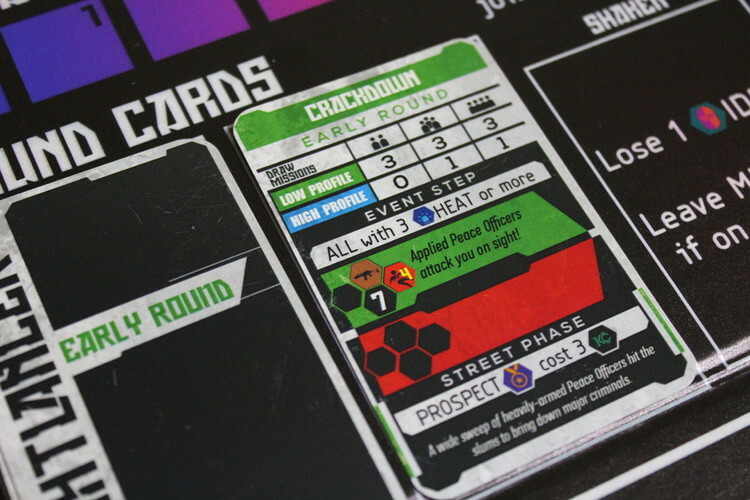 Other players can take on the same mission, either cooperatively, by becoming part of your crew or competitively by placing on the ‘second crew’ space. We’ll come back to missions during the Mission Phase of the turn. This is essentially the worker placement part of the game and were you will kit up ready to undertake the mission you chose during the prep phase. Most spots on the board (indicated with a circle) can only take one worker, however, there are a few that any number of workers can go on. These are Hard Work: discard one resolve and one health to gain a chip, Rest Up: take one resolve or one health and Cover Tracks: discard a card to reduce our heat by one. Black Market spots are attached to two cards. Choose one of these cards to buy, paying the cost at the top right and discard the other card. All the spots on the board are indicated by colour. The black market spots are blue. Dealing with the Euromafia are the red spots, here you can take out a loan, simply place a marker here, take ten money and a loan chip, but don’t forget to pay your interest at the start of every round! Or, you can buy prospects at the cost marked on this rounds event card. The green spaces allow you to take one money, the yellow let you draw one contact card, the purple let you play an opportunity card from your hand. There are also mixed spots on the board, these let you choose which action you want to take but will give you one heat. All actions are taken as workers are placed. Once everyone has placed all of their workers, it is time to move onto…..
Before going onto your mission choose three pieces of kit you want to take with you. Place these in the Loadout spaces above your Nightlancer card. Note that some missions will not allow you to use ‘noisy’ or ‘obvious’ pieces of kit. Each stage of a mission offers you a choice of two routes to attempt, though the penalty for failing is always the same. Each stage is a challenge that should be dealt with the same way as the event challenge at the start of the round. Failing an individual challenge does not mean your mission is over, take the penalty and continue, though you can choose not to continue with a mission after any stage. After each stage of a mission is complete, move your token along and continue to the next challenge. If you are part of a cooperative crew all players make their roll and the highest score determines if the crew succeeds or not. If they fail, all crew members face the consequences. If the crew completes the whole mission, take the rewards as indicated on the right hand side of the mission card. If competing crews are attempting a mission, then the first crew attempts the challenge first. If they succeed, they move onto the next stage, again, in the first crew position. If they fail, they move on, but onto the second crew spot instead. If both crews are still on the mission when they reach phase three they must ‘face-off’. The first crew chooses how they want to fight, melee, gunfight or marksman. The second crew must decide to accept the challenge or abandon the mission. If they accept the challenge, the first crew rolls a die and adds it to their chosen score, this is what the second crew must now beat. The loser of the challenge must drop out of the mission, but also lose five health. If, at any point, a player runs out of health they must move their token to the ‘shaken’ box on the board. They may restore full health and resolve but will be unable to go on a mission next round. After all missions have been resolved, players take back their nightlancer tokens (unless they are shaken) and all mission cards are discarded. Turn order for the next round is determined by players position on the heat track. The player with the least heat will go first. If players are tied on the heat track the previous order is reversed. Players must then discard their hands down to six and a new round can begin. After the eighth round end game scoring occurs. For each loan a player has they must pay back ten money or else lose five prospects. For each point of heat they must discard any combination of two cards or two money. For every five money they have, they may buy additional prospects. One prospect is awarded to the player with the highest points in each skill, using ‘always in effect’ cards, not kit. For each ideal they have, gain one prospect. 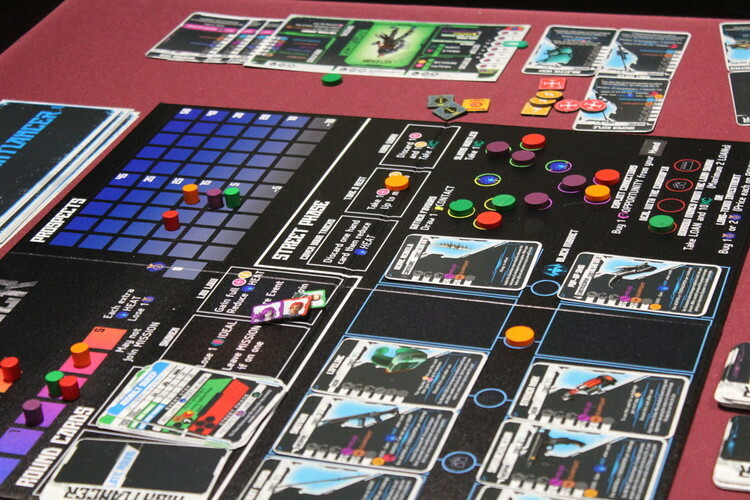 Players also gain bonus prospects depending on the number of ideals and agendas they have, between zero and three according to the chart in the rulebook. The player with the most prospects wins! 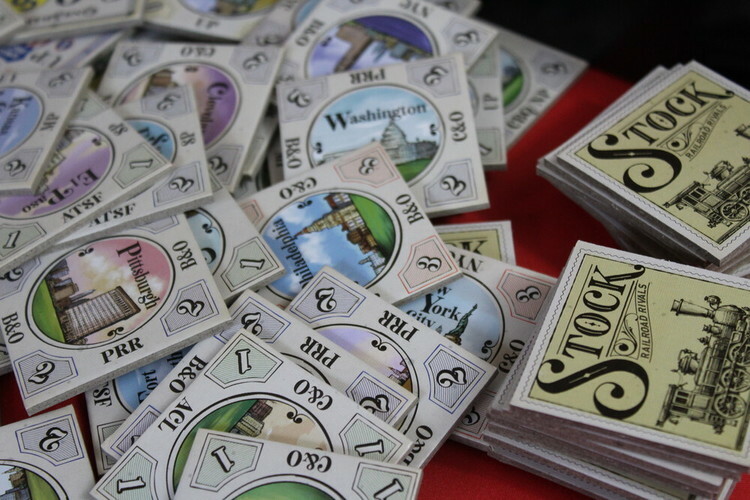 In the case of a tie, the player with the most money wins.